Peak expiratory flow (PEF) is a breathing test which is a very helpful in people with known or suspected asthma. 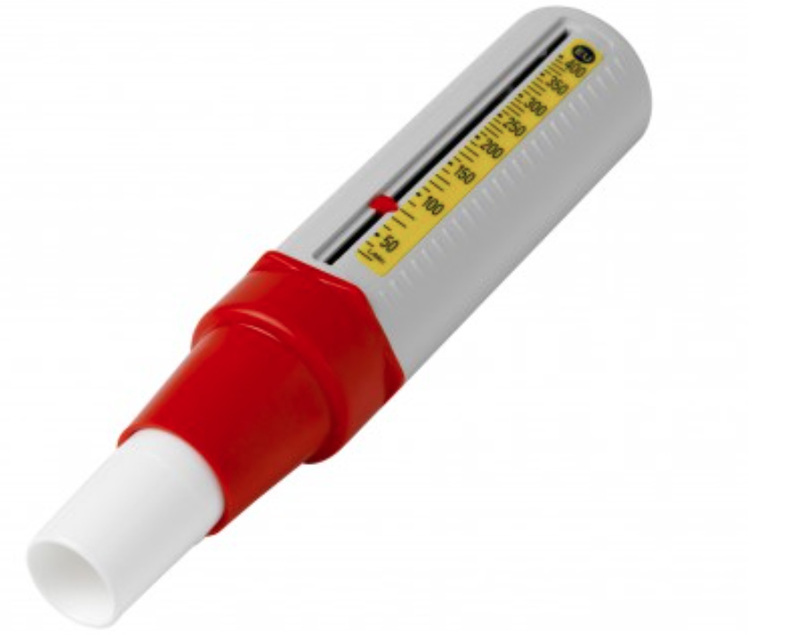 Peak flow is measured by making a short, sharp breath as hard as you can into a peak flow meter, as pictured. The peak flow of people with asthma tends to be rather variable, often lower in the morning and higher in the evening. In people who don’t have asthma, the peak flow is more steady. The graph below shows a peak flow chart recorded by a patient with asthma. When asthma is well-controlled, on optimal medication, the daily peak flow readings become less variable, and more like those seen in people who do not have asthma. When asthma is under good control the peak flow should not dip deeply in the morning. Therefore, a period of peak flow monitoring may be extremely useful to help identify people who may have asthma and also as a measure of good control in those who are known to have asthma. Peak flow meters are available on prescription, or may be bought from most pharmacies or on-line. When taking regular peak flow readings it is extremely helpful to record your results onto a graph, so that the trend may be seen at a glance. 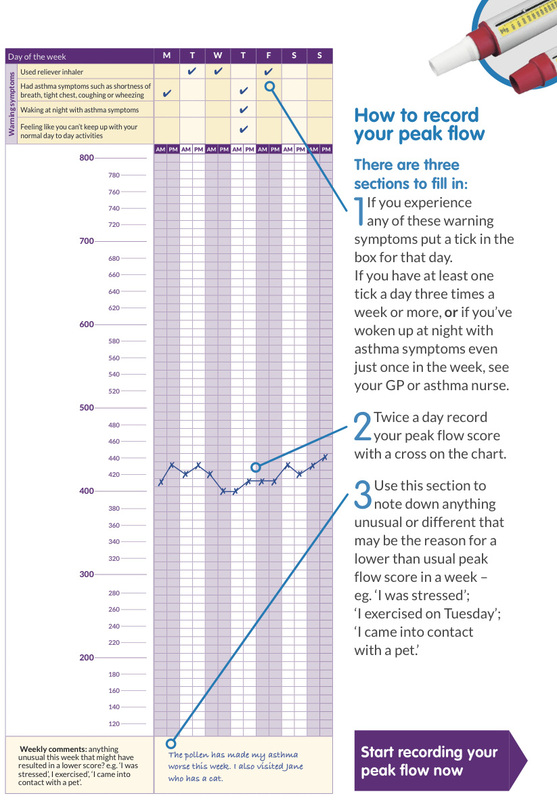 A suitable hard-copy graph is usually enclosed within the packaging of a peak flow meter, but may also be downloaded for example this one from Asthma UK, which also has advice about how to use a peak flow meter. Alternatively, and better, if you are comfortable using IT, you can enter peak flow readings directly into a spreadsheet which will plot the graph as well as performing useful calculations (pictured). A suitable calculator is pictured and available and free to download below. Please note that this calculator is under development and is provided “as is” on a goodwill basis. 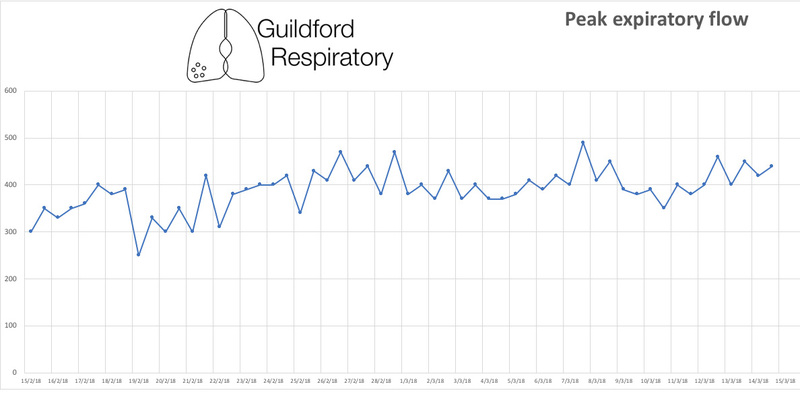 There is a blank spreadsheet which is ready to go, or a completed example which already contains one month of peak flow data recorded by a patient with asthma (pictured above).